Gigs across Kent and the South East...and beyond! We play at summer fêtes, fairs, festivals, marathons, rugby, football and sporting events, carnivals, bonfire nights, community groups, Christmas Light switch ons, parties, weddings, sporting events, charity fundraisers, school workshops, Scouts and Guides pow wows, corporate team building and activity days. We’ve played on top of a moving double decker bus in the Lord Mayor’s Show in London, on a floating stage in Wiesbaden, Germany, in the pouring rain in Drogheda, Ireland, all lit up for the Night Parade at the Battle of Flowers in Jersey, and in 30C heat at Coburg’s International Samba Festival. We’re a friendly and adaptable bunch, and not much fazes us! Create an impact with our full-sized band or we can provide a smaller group if your event is indoors. Bloco Fogo provides corporate entertainment with anything from three to 20 performers. We can perform in our colourful carnival costumes, or in clients’ own branded costume if preferred. We have worked with some of the UK’s leading entertainment agencies performing at corporate balls, company celebration parties, and brand launch events. We are also booked for sporting events and have performed for the MK Dons in Milton Keynes, at the Heineken Cup Rugby semi-final, providing the half-time and after match entertainment for Event360. We also played for the England International T20 Cricket match against Sri Lanka, for OURKIDBROTHER going out on Sky Sports. Looking for something different for a corporate team away day? Samba drumming is perfect for team building, as it encourages collaboration and learning a new skill, while being energising and great fun at the same time! We can work with group sizes from 10 – 150 people at any one time, and provide all the instruments and support that you need to make your team building day a success. Thank you for your interest in Bloco Fogo! We aim to reply within 48 hours. Our musical directors also lead samba drumming workshops for schools, Scouts and Guides, and other community groups across the South of England, as part of their extra curricular activities programme. 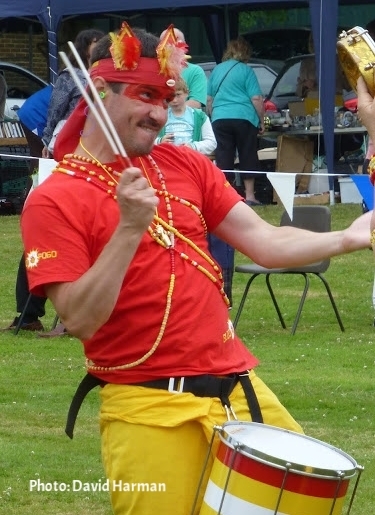 We can help to set up your own school samba band or drumming group too. Our schools workshop leader is CRB checked and a qualified music teacher. Please note - we are a community band and dependent on volunteers to play at each performance. We often play with 15-20 drummers and normally like a minimum of around 10 players to create sufficient sound. In the extremely unlikely event of being unable to assemble enough players, we would hope to give you as much notice as possible before your event.